Peer review of article article analyzing carbon emissions in buildings. 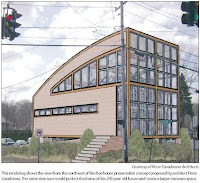 Article on the proposed design of the Philips Roe House by Peter Caradonna Architects. 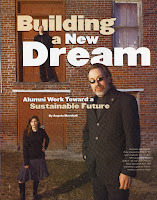 Featured & pictured in article focusing on New York Institute of Technology alumni working in the field of sustainability. 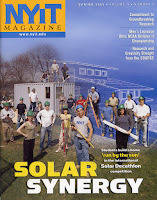 Pictured on cover and in article spotlighting New York Institute of Technology students working on the schools 2005 Solar Decathlon entry. Pictured in article "Restoring Woodhull House" due to involvement to help restore a historic house on Long Island with NYIT faculty and fellow students. Presentation on sustainability messaging and life-cycle decision making considerations for professional and personal decisions. Presentation on the basic concepts of Sustainability from initial decision making, environmental and social impacts, design decisions, and product selections. 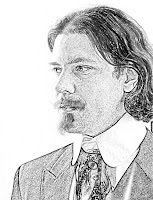 Review of knowledge required and resources available to select and implement appropriate passive design strategies based on project type and location. Moderator for USGBC-LI panel discussion focusing on the interaction between the design and construction team for a LEED project. Panelist for Attainable Long Island panel discussion on the design competition and the LEED for Homes process. Panelist for USGBC-LI panel discussion on how to manage a LEED Job Site during the construction phase. Discussions focused on approaches for both the design and construction teams. 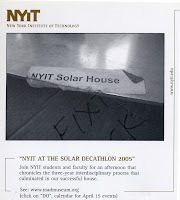 Presentation given to various classes of New York Institute of Technology. Provided an introduction to LEED including review of credits and examples of different approaches how the credits can be achieved.